The perfect acoustic drum samples for country, folk, bluesy songwriters. 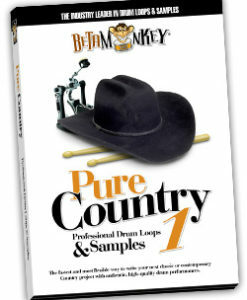 If your music needs that Alt Country Nashville sound, Pure Country® II offers 700+ loops to inspire your next project. Live, gritty, earthly – if you’re after live acoustic drums, this one is a great fit. Add a bit of Alternative Country, Americana, Folk, and Blues Flavor to your Sound! 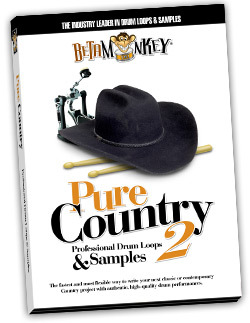 Beta Monkey Pure Country® II is a gritty collection of all-acoustic drum loops and samples for country songwriting and more, including Alt Country, Americana, Blues, Folk, and Roots music genres. It’s live and earthy mix has the solid grooves you want with an airy and open drum mix, ideal for any acoustic or semi-electric tracks. This versatile collection of acoustic grooves offer 12 different Groove Sets™ — featuring more than 700 drum loops – main grooves, groove variations, fills, one shot endings, intros and more. Like all of our products, Pure Country II is organized for easy song construction, with each Groove Set™ featuring ALL the necessary elements to get your next tune done right. Simply preview for the right grooves, and use the other loops in the Groove Set™ to quickly build an authentic drum track. The fastest and most flexible way to write your next classic or contemporary country project with authentic, high-quality drum performances – at prices that will have you back for more. Perfect for multiple styles of country songwriting (traditional and contemporary) as well as roots rock, southern rock and acoustic singer-songwriter styles. If you like your drum tracks to have that live, in-the-studio vibe with minimal processing, then any of the Pure Country II drum parts will find a home in your future songwriting projects. Authentic Acoustic Loops: Not the slick super-polished drum sound of Nashville here – a natural and open drum sound give users the perfect groove and vibe for country, folk, Americana, blues, and alt country tracks. 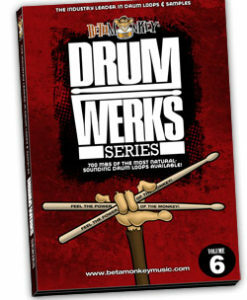 Versatile Grooves: Over 700 drum loops, covering ballad feels, straight-ahead beats, shuffles and semi-shuffles, double-times and more. If your music needs live acoustic drums, Pure Country II has it covered. Live drumming performances will add that essential feel and vibe your tracks need. Cohesive Drum Sounds: All drum loops and samples are from a single recording session. All grooves, fills, one shots, and samples are sonically-matched and will mix together perfectly. No random drum sounds – a cohesive loop set recorded and developed to work as a unified songwriting resource. Fully-Sampled Drum and Cymbal Samples: A Beta Monkey trademark, you also get a complete matching set of drum and cymbal samples included with the loops. We sampled a Smith Custom Maple drumkit (kick, snare, three toms) and a set of Zildjian cymbals to give this sample package added versatility. Take even control over your drum tracks by adding single hits to the collection’s grooves or sequence new beats from scratch in your choice of virtual instruments. It’s an added bonus our customers swear is worth the price alone. 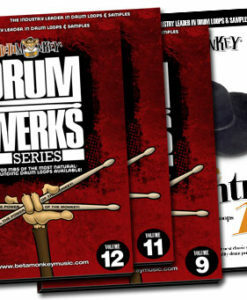 Cross-Collection Compatibility: All drums from Pure Country II will blend perfectly with the loops and samples found on Drum Werks VII and Drum Werks VIII. We refer to the drums in this series as the River Sessions and, all together, form a sizeable groove resource for anyone with a multi-song recording project. 715 (565 MB) original, license-free, 16/44 country drum loops. 16-bit WAV, APPLE LOOPS/AIFF, REX2 formats.